Do you feel like you might be an underserved entrepreneur, someone who traditional investors and venture capital firms might overlook? Mary Iafelice believes in helping people like you by investing in problems worth solving. She’s the co-founder of Humble Ventures, based in in Washington, DC. It’s focused on investing in disadvantaged or underserved entrepreneurs. They invest in companies most traditional VCs would pass on like an urban barbershop app, an employment review website for veterans and a platform for women’s GI health. The diversity challenges facing venture capital investment. Why empathy is such a crucial life skill in the future of work. 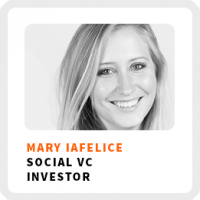 How Mary and her co-founders started their VC fund and how they work differently from a traditional VC. How well an entrepreneur knows their customer is a core indicator for Mary to judge how well a business might do. Some advice for introverts on how to build your network. Wake up time: Sometimes 9:30-10:00am, but usually around 8:30am. Core work activities + habits: 1) Facilitation with the founders she develops. 2) Getting out and being present in the community. 3) Working on curriculum design for the companies they bring on. Regains focus by: Going out to the country. 90-day goal: To win money through non-profit fundraising. 1) The importance of customer discovery and making it as personalized as possible. Getting out on the streets and doing the groundwork to understand your customers and their problems. 2) Work on understanding pricing. Learning about willingness to pay, which ties back into understanding your customers personally.